Do whales really talk to one another? Whales produce low-frequency sounds that allow them to communicate across long distances. Research has found that among the fin whales, only males produce these calls. The long, low frequency sounds of male fin whales attract females to patches of food, where mating can then occur. Scientists now realize that this means that the increasing amounts of sonar activity from ships in the ocean may interfere with the ability of these males (and other ocean species) to find mates, which may in turn threaten many species’ survival. Humpback whales, which can grow thirty to forty-five feet in length, migrate between the Caribbean Ocean and off the coasts of Canada and New England in the Atlantic. 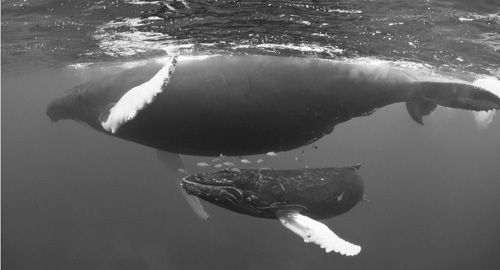 Like other whales, they communicate using low-frequency sound that can travel for miles.